Endless Skyway Bitter finds inspiration in the English style but derives its grapefruit bitterness from West Coast hops. Like the finest English examples, the bitterness is assertive but balanced with a nutty maltiness. "Endless Skyway" is a nod to Oklahoma's favorite son, Woody Guthrie. May there always be endless skyways above you and golden valleys below you. A refreshing and lively Kolsch anchored by a hearty malt backbone. Kept crisp by the gentle bitterness and subtle spice of Saaz hops. The snappy carbonation releases an aroma of grainy sweetness punctuated by lightly floral hops. A good beer to accompany get-togethers with friends, and game days. 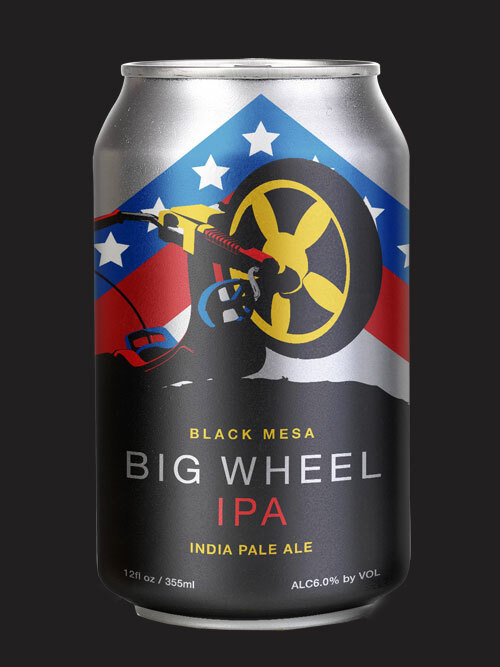 An East coast style IPA with the right amount of hops and a malty backbone, Big wheel IPA was brewed to celebrate the Daredevil in all of us. Especially for those who fearlessly jumped everything they could while not wearing a helmet. That’s just how we rolled. With a 3,000 year brewing tradition along the Rhine River in Germany, Altbier is possibly the oldest continually brewed style in the world. "Alt", or "old" in German, refers to the longer conditioning time required to achieve the supremely mellow balance of cereal malts and brisk hop bitterness. At 4.9% ABV, don't over-think this one, just get to a patio. You can call it an "Alt" to impress you're friends. Like the brewers that came before us, we just call it beer. This doppelbock is fermented with an ale yeast to allow fruity esters to brighten the dark malts. The cherry notes look ahead to warmer temperatures while rich maltiness provides the sustenance of a traditional doppelbock. For everyone who gets twitchy feet in the spring, this is your sidekick for exploring the black spots on the map. Ramble young man, ramble. Los Naranjos is our 3rd and current collaboration with Oklahoma City's beloved Elemental Coffee Roasters. The stout is brewed with de-bittered black malts that do not compete with the Columbian Naranjos coffee bean known for its silky body, big tangerine acidity, and cocoa finish. Available on draft in November and in bottles in December 2015. The trajectory of our Endless Skyway Bitter recipe lands here. We doubled it, then allowed the Double ESB rest in cognac barrels for 7 months. The unfolding layers of oak and vanilla take an already decadent beer and make it Extra Special. Red Badger Stout was our 1st collaboration with Elemental Coffee Roasters. The stout was brewed with de-bittered black malts that do not compete with the semi-washed Sumatran Red Badger coffee bean. Prominent earthy and vegetal notes. Winter 2013/14. Ethiopian Ardi Stout was our 2nd collaboration with Elemental Coffee Roasters. The stout was brewed with de-bittered black malts that do not compete with the Ethipoian Ardi coffee bean known for its creamy body and round strawberry notes. Winter 2014/15. Elemental's Purusha roast.